After a decade of very disappointing albums, the vintage 80's alt rock band that contributed to my high school audio scrapbook with Out of Time & Automatic for the People, have found their way out of their middle age fog. With help from producer Jackknife Lee, the band has dusted off their distortion peddles, found some memorable guitar runs and crafted some melodic & ironic lyrics. Accelerate has the fire that is reminiscent of Monster or New Adventures in Hi Fi, but also pulls tones and colors from their earlier albums. I know the "kids" have their own bands that represent their generation. The members of REM may have grown older and may not be considered "trendy," but don't give up on the guys that help create today's sounds. 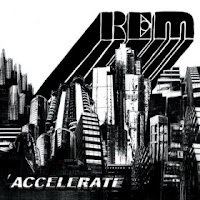 These guys finally have something to offer and if you have ever been an REM fan, you are sure to find a few tracks on this album that sound familiar but fresh. This is a great Rock album for 2008.